“Rejoice, rejoice, everybody rejoice!” From the funky Flying Monkeys to the magical witches to the Yellow Brick Road, St. Stephen’s and St. Agnes School’s jovial, fervent production of The Wiz certainly gave audiences much to smile about. Written in 1974 by Charlie Smalls (music and lyrics) and William F. Brown (book), The Wiz premiered on Broadway in 1975 and won seven Tony Awards, including Best Musical. It is a retelling of L. Frank Baum’s timeless classic, “The Wizard of Oz,” featuring aspects of African-American culture and music. Swept away from her Auntie Em and Uncle Henry by a powerful tornado, Dorothy Gale finds herself in the mysterious land of Oz, trying to find a way back home. After meeting the Scarecrow, Tinman, and Cowardly Lion, Dorothy embarks on a journey with her new friends to visit the Wiz. Together, they must defeat the sinister Evillene, but with the help of Addapearle, the Good Witch of the North, and Glinda, the Good Witch of the South, Dorothy learns to cherish life’s friendships and appreciate her struggles. From the beginning, cast members made strong, visible character choices and remained actively engaged every moment they were on stage, even when they were not speaking. The cameo appearance of a live dog was also well-received and added to the authenticity of the storyline. Capturing Dorothy’s charming innocence, Adhana Reid infused emotion into each of her scenes and songs, her vocals showcasing soulful attitude within her mature alto tone. She connected believably with others on stage, especially the Scarecrow (Jewell Dupree), Tinman (Josh Movius), and Lion (TreVaughn Allison). Dupree’s bungling walk and flexible limbs captured the Scarecrow’s boneless movements admirably, while both Movius and Allison displayed keen comedic timing and bold physical choices that effectively defined their characters. 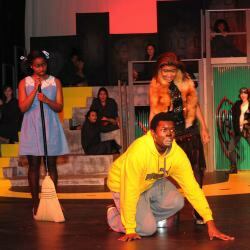 In the titular role, Alex Collins captured the mysterious, ambiguous aura of The Wiz with his domineering voice, while Heather Hartzell as Glinda displayed pleasantly rich singing and impressive belting abilities. Memorable, cohesive ensembles included the Flying Monkeys, who performed a variety of tricks and stunts including cartwheels and jump splits, and the Field Mice police squad, who were comically entertaining and adorably squeaky. 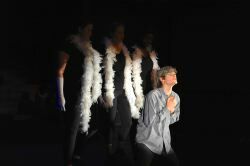 Despite some struggles with enunciation and pitch, the cast remained enthusiastic, their energy never wavering. 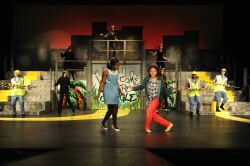 From the start of the production, technical elements were strongly executed and remained a highlight throughout the show. Captivating strobe lighting effects, colorful gel projections, and adept spotlighting contributed to the upbeat, lively atmosphere. Tackling the daunting task of operating twenty body microphones, the sound crew rarely missed cues, and there were no audible cracks or muffles. The versatility of the multi-level set left no stage area unused, while the unit set transformed into various scenes with interchangeable graffiti wall-hangings and other unique elements, such as a tire throne and balloons. Filled with humorous warmth and powerful symbolism, the underlying themes of The Wiz address something much more profound: the struggles of African-Americans to find a legitimate place in American culture. 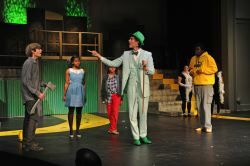 This production of The Wiz gave the cast and crew at St. Stephen’s and St. Agnes School a chance to showcase their creativity and zeal, while simultaneously conveying the production’s deeper historical and moral messages. This article can be linked to as: http://showbizradio.com/go/9274.